Home » Football » Look out New England, Here come the Jets!!! Look out New England, Here come the Jets!!! The Jets hung on to win against the Cleveland Browns on Sunday to have a winning record for the first time in two years. The Jets started out really slow offensively and there was a chance that they were going to lose this game, which would have been one of the worst losses in franchise history. The offense came alive in the second half and were able to win the game 17-14, setting up a date with the New England Patriots next week for a battle of first place. This game was going to be ugly as both teams have terrible rosters and in the middle of a rebuilding phase. The Browns are winless on the season and the Jets were surprisingly 2-2 going into the game. The winner of this game was going to feel relieved, while the loser had blown the easiest game on the season. The Jets offense started out slow once again. Both teams started out exchanging punts in the first quarter and the game was scoreless at the end of the first quarter. Neither offense was able to put up any points in the start of the second quarter either, the Browns were gaining yards on the Jet defense, but were not able to put points on the board. The Jets were able to put up a decent drive to score a field goal at the end of the half and give them the lead going into halftime. The Browns came out firing in the second half and had their best drive of the game to score a touchdown in the first drive of the third quarter. 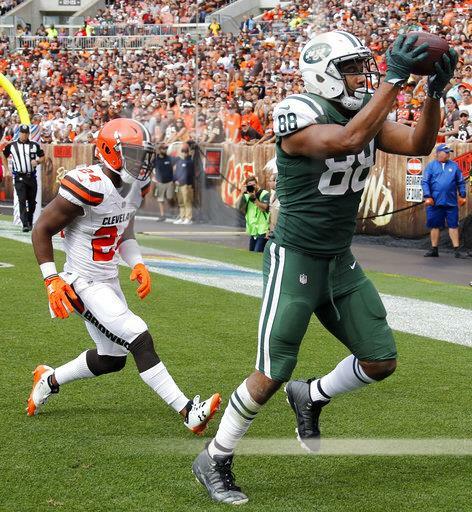 The Jets followed it up with a punt and momentum was clearly on the Browns’ sideline. The Browns, who had benched their rookie quarterback Deshone Kizer for Kevin Hogan, were looking to add to their lead until Hogan threw a interception which put the Jets deep into Cleveland territory. The offense was finally able to get going and capitalized on the Browns mistake to retake the lead and they never looked back after that. The Jets added another touchdown after the defense stopped the Browns inside the 10 yard line and the rout was on. The Browns scored a meaningless touchdown inside the two-minute warning, but were not able to recover the ensuing onside kick to end the game. The Jets were able to get a win they needed to have and the Browns remain the worst team in football. The offense was slow again in this game, but was able to do enough to end up on the top. The offense will need to be lights out in order to win the game next Sunday. The defense was not good in this game, despite of the scoreboard. They were giving a lot of yards to the Browns, but were getting lucky because the Browns did not put up many points on the board. If the defense plays this way next week, they might lose by fifty points against the Pats. The special teams did what it needed to do to win the game. The Jets now go to New England to face the Pats, in a game in which the winner will have sole possession of the AFC East. The Bills lost today, which means there is a three way tie atop the AFC East standings. The Bills are on bye next week, which will allow the Pats and the Jets, an opportunity to take the lead. The Pats are obviously the best team in the defense, but they have not looked impressive at all this season. The Jets should lose next week, but they will have many opportunities against the weak New England defense. The Jets will need a lot of things to go their way, but they are not going to be huge underdog next week and it will not be shocking if they win. Right now the Jets are onto New England, with a chance of grabbing first place. If you had told me in the preseason that the Jets and the Pats were tied for the AFC East going into their first meeting, I would have said you are drunk and do not know anything about football. The Jets have been proving their fans wrong all season and can send shock waves through the NFL by winning next week’s game.